For those of you creating slices, we’ve added a much-requested feature today. You can now copy syncpoints across slices, using our new “Import syncpoints from a file” feature. 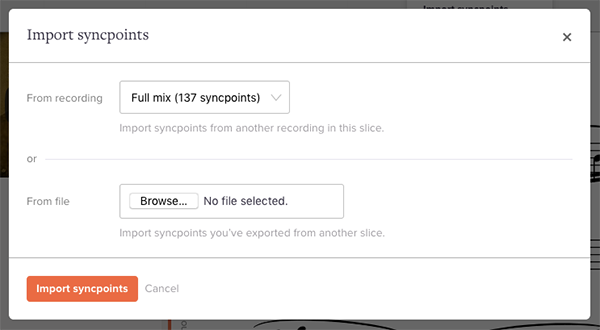 We’ve already had an “Export syncpoints” feature, which lets you download your syncpoints to a file. Now, we’ve added the final missing piece: you can import those files into any other slice’s recordings. It’s simple to use. When viewing the syncpoint editor, click the “More” menu and “Export syncpoints” to save a syncpoint file. Then, in any other slice, use the syncpoint editor’s “Import syncpoints” to load that file.